MUMBAI: The weekend is nearing, and we have some exciting Bollywood updates in store for our readers. Bollywood superstar Shah Rukh Khan, who is known for supporting acid attack victims through his Meer Foundation, urged his fans also to lend their support to such brave survivors. The Baazigar actor uploaded a video on Instagram on Wednesday, sharing a powerful message for all. Shah Rukh’s Meer Foundation, which has been established to provide support to acid attack survivors through medical treatment, legal aid, rehabilitation, and vocational training, has also teamed up with Vogue and Hothur Foundation to free acid attack victims from all the social evils and heartless acts of violence and discrimination. National Award-winning filmmaker Hansal Mehta enjoys the ‘beautiful process’ of making films but says their marketing and release have become such a ‘thankless and pointless’ exercise. ‘Films do get made. And it is usually a beautiful process of co-creation, agony and ecstasy. But marketing and release of films has become such a thankless and pointless exercise,’ Mehta tweeted on Thursday. ‘...Adheres to boring templates, is very expensive, has little innovation and involves mindless effort,’ added the director, known for films like Shahid, Aligarh, and Simran. Actor Rajkummar Rao welcomed actors Mouni Roy and Boman Irani in Made in China and said that the upcoming film will be a crazy ride. Mouni is set to play Rajkummar’s wife in the movie, which will be will be directed by Gujarati director Mikhil Musale. Made in China will start rolling in September in Mumbai and then shoot in Gujarat and China. This is Rajkummar’s second collaboration with Dinesh Vijan of Maddock Films after the horror comedy film Stree, which will hit theatres on August 31. Veteran actor Anupam Kher has started shooting for the upcoming American drama series New Amsterdam. He said that he feels the same excitement and nervousness that he had on the first day of the shoot for his maiden film Saaransh. ‘A New Beginning on first August, 2018. I start the shoot of my American series ‘New Amsterdam’ today. I have the same excitement and nervousness which I had on January 1, 1984, my first day of shoot of my first film ‘Saaransh’. 34 years later...’ Anupam tweeted on Wednesday night. Inspired by Bellevue, the oldest public hospital in the US, the series follows brilliant and charming doctor Max Goodwin played by Ryan Eggold, the institution’s newest medical director who sets out to tear up the bureaucracy and provide exceptional care. In addition to Anupam and Eggold, the cast of the series includes Janet Montgomery, Jocko Sims, and Tyler Labine. On the Bollywood front, Anupam will be seen in The Accidental Prime Minister. Actress Taapsee Pannu, who has turned 31, shared a ‘piece of dope’ and said that there is no high more intoxicating and energizing than the high of being self-made. Taapsee tweeted, ‘As I age towards becoming an ‘antique’ sharing a piece of ‘dope’ with you all... There is no high more intoxicating and energising than the high of being ‘self made’. Try it, it works. You all have been a part of my journey,’ Taapsee tweeted. The actress, who turned 31 on Wednesday, made her acting debut in 2010 with the Telugu film Jhummandi Naadam. Since then, she has appeared in a number of critically acclaimed films such as Aadukalam, Baby, Naam Shabana, Pink, The Ghazi Attack, and Soorma. On the big screen, Taapsee’s latest release is Mulk, a story of a Muslim family trying to reclaim its lost honour. She also has two more films in her kitty: Manmarziyaan and Badla. Bollywood actor Varun Dhawan and rapper Raftaar will represent hip-hop festival Breezer Vivid Shuffle Season 2. With the aim to create a bigger hip-hop dance scene in India, Breezer and Only Much Louder (OML) are all set to return with the second season of the fest. The previous season saw a participation of over 1400 dance enthusiasts from five cities across the country. ‘Breezer Vivid Shuffle has been a thrilling experience. The vibe of the competition has attracted some great performances last year and it's exciting to see how hip-hop enthusiasts collaborate, learn and have crazy fun together,’ Varun said in a statement to a leading publication. The pan-India competition will comprise five regional rounds and one grand finale. It will happen in September across five cities: Shillong (September 2), Delhi (September 9), Kolkata (September 15), Bengaluru (September 16), and Mumbai (September 30). This will be followed by a grand finale in Mumbai on October 13. In addition to winning a cash prize at the hip-hop festival, the winners will get a chance to be featured in the video with Varun and Raftaar. Actor Sumit Kaul says filmmaker Anubhav Sinha praised him so much during their first meeting that he was ‘almost embarrassed’. Sumit is gearing up for the release of his next Bollywood film Mulk, helmed by Anubhav. ‘As an actor if you want a major ego boost you have got to work with Anubhav Sir. In my first ever meeting with him, he showered me with so many praises for my audition that I was almost embarrassed,’ Sumit said in a statement. Sinha is a pleasure to work with, said the actor. Sumit's role in Mulk is contrary to that of Haider. ‘While I played this goofy sinister police spy in 'Haider', my character in 'Mulk' is unpredictable, displays no emotion and one cannot gauge what goes on in his mind,’ he said. ‘Though the length of my character in the film is less, he is integral to the graph of the film. In many ways, he is the reason for the conflict in the film,’ he added. Actors Pulkit Samrat, Varun Sharma, and Manjot Singh, better known as Hunny, Choocha, and Lali from the films Fukrey and Fukrey Returns, reminisced about their favourite memories together ahead of Friendship Day, which falls on Sunday. Most recently seen together as part of Pepsi's Kyun Sookhe Sookhe Hi campaign, which celebrates the combination of food, fun, and Pepsi, the three actors share an easy camaraderie and their bromance is visible both on-screen and off-screen. They have shared what they like to call their ‘yaari ke kisse’. ‘I consider myself lucky that my reel life friends are my real-life buddies. The three of us connected immediately when we met for the first time on set. We have been inseparable ever since then. The kind of things we get up to when we are together is crazy,’ Pulkit said in a statement. ‘In fact, when we were shooting for ‘Kyun Sookhe Sookhe Hi', we used to get together in one vanity van between shots and eat everything from a vada pav to momos to dosa along with Pepsi and just crack jokes, till the next shot was called. I think we literally bonded over our food choices,’ he added. In the past few years, Bhushan Kumar has emerged as one of the most sought-after film producers and has given successful films like Hindi Medium, Raid, and Sonu Ki Titu Ki Sweety. The music baron turned film producer is aiming to gather varied genre of cinema under his banner. He is all set to now produce a much-awaited costume drama, Taanaji, along with Ajay Devgn. Taanaji will mark Bhushan Kumar’s first venture into costume drama. The film will go on floors on 25 September, after Ajay Devgn finishes the shoot of Akiv Ali’s next, which is being produced by Bhushan Kumar and Luv Ranjan, and Indra Kumar’s Total Dhamaal. Taanaji will showcase the life of this unsung warrior of glorious Indian history, who fought for his people, soil, and his king Chhatrapati Shivaji. The film will be directed by Om Raut, who has to his credit Lokmanya Ek Yugpurush (2015), the Marathi biopic on Bal Gangadhar Tilak. 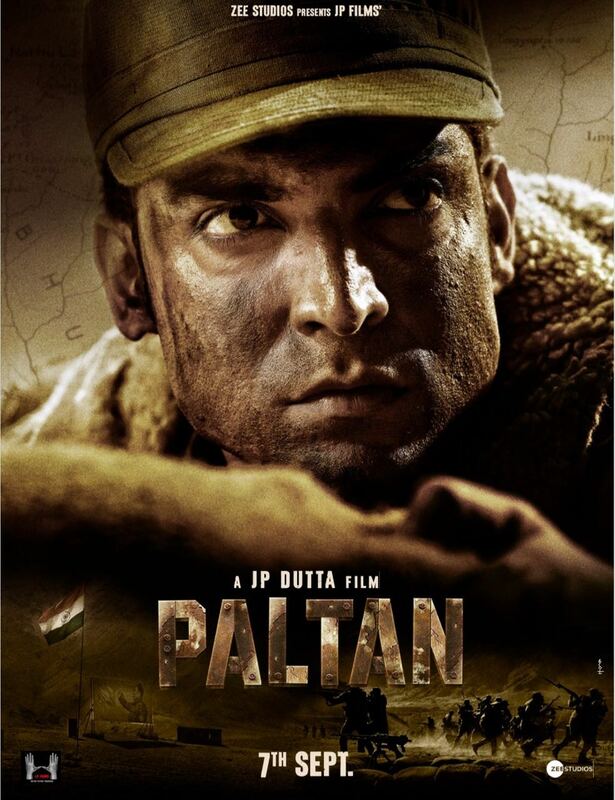 Gurmeet Choudhary looks inspiring as an army soldier in J P Dutta's PALTAN! Gurmeet Choudhary, who is eagerly anticipating the release of J P Dutta’s war drama Paltan, has recently revealed the first impressive look of his character. Looking every bit his character of an army soldier, Gurmeet is all set for war! It is a lesser-known fact that the popular actor has an army background in real life, and thus, this film is special for him. His father, Sitaram Choudhary, served the country as a Subedar Major. Sharing a picture of him clad with dust in an army look, he had mentioned on Twitter, ‘We might not KNOW them all but we OWE them all. It’s time to #JoinThePaltan’. Since Akshay Kumar and wife Twinkle Khanna made an appearance on Koffee with Karan, everyone was awe of their chemistry they share. Since then, they have been trolling each other in a funny manner on social media and in media interactions. Recently, Twinkle shared a post where she wrote that her husband sees food with more love than he sees her. Meanwhile, Akshay Kumar, while talking on a leading news channel, was asked if he supports his wife’s decision of quitting movies and taking on writing. He said after seeing the 14 movies that she did, writing was the best decision she has ever taken. He said when they used to shoot together, she used to finish reading one novel a day. Gul Panag gave birth to a baby boy six months ago but decided to keep it a secret. Well, there is a reason behind keeping his birth away from the media. While speaking to a leading publication, Gul said that she and her husband are very private in their life and that’s why they kept this as a secret. Her family and friends knew about it. She said that sometimes, it becomes a little difficult to manage sleep and feeding the baby. The baby is 6 months old, and she said that this is the best phase of her life. The gen-next star of Bollywood, Kartik Aaryan, who enjoyed phenomenal success with his recent release Sonu Ke Titu Ki Sweety, has kickstarted the shooting of his upcoming film Luka Chuppi today along with co-star Kriti Sanon. The actors took to their social media accounts and shared the news with their fans. Amitabh Bachchan and Ranbir Kapoor are shooting for the movie Brahmāstra together in Berlin. The two took some time out and watched Mission Impossible together. Big B took to his Instagram profile and shared a picture of the two enjoying the movie.